I am initiating a new regular blog post that I like to call, 'Around the Hood.' As you may know, we are located in the bustling up and coming hood of Kwun Tong. You may raise an eyebrow at that last statement, but I'm telling you, in just the last 5 months that I have been working here, I have seen some serious changes for the better. This was big exciting stuff. Real pizza, woohoo! A beautiful new boutique hotel just steps from our office. Definitely a sign of improvement..
Ok, so this isn't new, but I just found out about it. Not everyone can take a boat to work you know! But today's feature will be about Gossip Pantry. I head in for a late lunch which translates into tea at the GP. Not big on decor, the room felt a bit sparse with seemingly no decoration. But the menu looked promising and the service attentive, so I can overlook the lack of atmosphere. The tea menu was short but covered the basics; pastas, sandwiches, salads, and what I ordered; roast eggplant. I was pleasantly surprised how good it was. And for $26 with a tea or coffee! 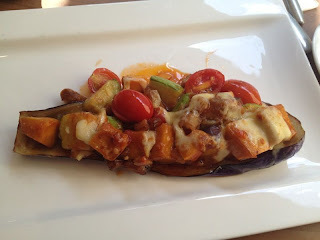 A grilled eggplant topped with pumpkin, zucchini, tomato, a little cheese and a tomato oil and this thing was delicious. So if you're in the hood I recommend stopping in for tea, although there is one huge pitfall. NO WINE MENU! I suppose they don't have a liquor lisence, but not a drop to be spotted. According to openrice.com there is a $50 corkage fee if you'd like to bring your favorite tipple along. Hmph. Anyone else work and lunch in Kwun Tong? Share your thoughts, please.